Broceliande is a WEB comics composed by single page stories made with watercolours. Non verbal webcomic. Two boys work in a gold mine to move mud. In these hard live condition, their strong friendship is their only chance to survive... I submit to you this new story without text titled "Work Camps, C5348". I've drawn it with a lot of excitements. It will be a success if you can get only a part of these feelings. This story began like The Elf's Apprentice: one drawing gives idee for the next one. These pictures were drawn on A5 (14.8x21cm) 150g/m2 paper with pencil. Non verbal webcomic. A young elf follows his teacher through the Broceliande forest. While they cross a village, the boy meets a girl. But some residents do not approve strangers in their community... The Elf's Apprentice is a non verbal story that I began in January 2005, a little bit by mistake. 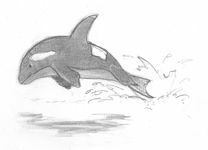 In April 2005, it contained 43 pencil drawings. During two years nothing happened. Between February en January 2007, I made 30 new drawings that end the first chapter of this story. An owl in the belfry. These drawings illustrate a book I've written in French named "Daniel and Isaline". These drawings illustrate a French tale written by Jan VAN BOGAERT ("Les contes du paradis perdu", Edition Drouot, ISBN 2-87095-162-0). These drawings illustrate a book I've written in French named "La Bete". It is the story of two teenagers, Tom, a strange boy, and Benedict, a very inquisitive girl. That's not always easy to be parent. 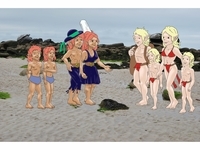 These characters have been inspired during my first holidays in Bretagne, France. They were also the subject of my first watercolour pictures. Drawings for new year wishes. 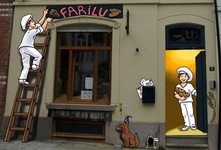 Drawings for "Kiliwolu", de French scout newspaper of Brussels South between 1985 and 1988. The first pictures have been drawn on the site oekakicentral. The artwork of the other members of oekakicentral has demonstrated to me that it was possible to make beautiful things with computer.